The value of whole-body MRI is constantly growing and is currently employed in several bone pathologies including diagnosis and prognosis of multiple myeloma, musculoskeletal imaging and evaluation of treatment response assessment in bone metastases. Intra-patient follow-up MR images acquired over time do not only suffer from spatial misalignments caused by change in patient positioning and body composition, but also intensity inhomogeneities, making the absolute MR intensity values inherently non-comparable. The non-quantitative nature of whole-body MRI makes it difficult to derive reproducible measurement and limits the use of treatment response maps. 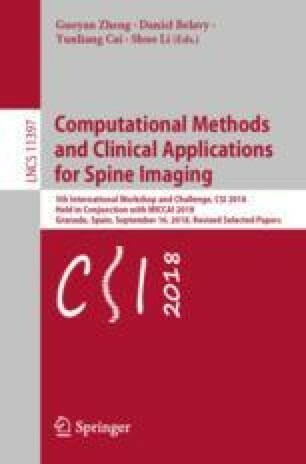 In this work, we have investigated and compared the performance of several standardization algorithms for skeletal tissue in anatomical and diffusion-weighted whole-body MRI. The investigated method consists of two steps. First, the follow-up whole-body image is spatially registered to a baseline image using B-spline deformable registration. Secondly, an intensity standardization algorithm based on a histogram matching is applied to the follow-up image. Additionally, the use of a skeleton mask was introduced, in order to focus the accuracy of algorithms on a tissue of interest. A linear piecewise matching method using masked skeletal region showed a superior performance in comparison to the other evaluated intensity standardization methods. The proposed work helps to overcome the non-quantitative nature of whole-body MRI images, allowing for extraction of important image parameters, visualization of whole-body MR treatment response maps and assessment of severity of bone pathology based on MR intensity profile.